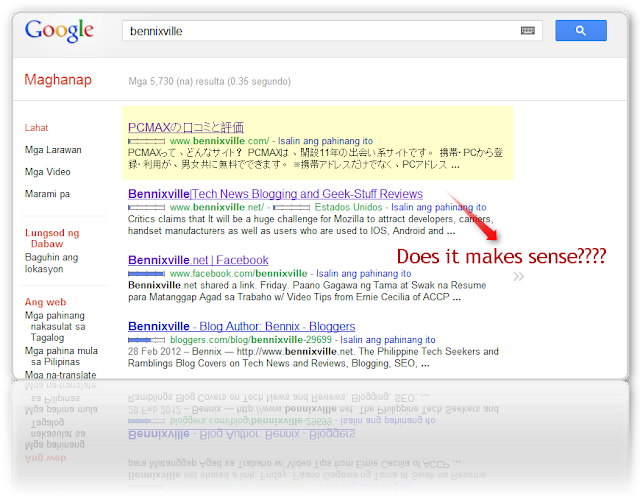 Home Bennixville Old "bennixville.com" turns Japs? I am a little bit disappointed having my blog Bennixville.net gets only the second place in Google now because the old Bennixville.com has been acquired by a Japanese copycat. Though the site was named to “PCMax” it uses the bennixville.com domain enjoying all the quality links that I have put up on the domain before. I hate more when knowing it’s now on PR3 after 3 months I’ve abandoned it. I can’t blame myself of giving up the old domain; I encountered trouble that time when I try to renew it. So, my decision is swift and I am very optimistic that could regain everything. But how’s really going? Well, to all my readers I am still happy to let you know that because of your continuous support my traffic starts to grow, not huge as the old one but it’s improving day by day. My Google Page Rank gets back to PR 2 and hoping to regain my Alexa stats soon. Anywayzzz, I don’t really fret for that, there’s a lot of things to get focus online and not for copying others name will give you the success. I mean its branding and making it unique will gives you the better credibility. I am planning to re-design Bennixville.net and hoping to launch my own deal / classified ads site this year. I am just praying to have more time to work. What happen to my Blogstar of the Month? As you can see, I haven’t written any review last April due to busy schedules. The main problem of organizing this thing is the availability of the blogger that you’re going to review. Some are not so, interested or lack the time to fill-up the interview form and I myself don’t have much time to follow up.lol. But bennixville.net will continue to find interesting bloggers in the web and if you’re so interested don’t hesitate to contact me anytime. To have you spotlight here is my honor. Thanks. Please make a comment below and do violent reactions.